Antoinette greets me from the third floor of her apartment building in Visitacion Valley. I look up at her from the sidewalk as she says hello and beckons for me to enter the complex. It’s hard to hear her over the roar of traffic entering and exiting the highway just across the street. “There are too many stairs for me, I’ll throw the keys down to you,” she explains. I let myself into the gate and climb the stairs. As I reach the third landing, slightly out of breath, I wonder how she does this daily, particularly since she requires a cane to get around these days, and uses an oxygen tank. Antoinette is 69 years young. She has an extraordinarily rich, Dutch accent and is dressed in a bright red dress and gray sweatshirt jacket – perfect for warding off the day’s chill. In 1977, Antoinette moved to New York from Holland in order to pursue a career in business. At 27, Antoinette knew she wanted to make something of herself, so when the opportunity to work at Holland American Cruise Company in the U.S. as a computer operator and data processor presented itself, she jumped at the chance. In 1980, after a number of stints in the Big Apple, including working at a brokerage firm on Wall Street, Antoinette packed her bags and headed west to San Francisco to soak in the California sun. She met her husband, a Vietnam veteran, who suffered from PTSD after the war. While he never fully recovered from the trauma he experienced as a result of combat, he and Antoinette raised three children together. Antoinette has many skills. She worked for Coca Cola, and then the federal government. She attended San Francisco City College and studied court reporting which opened the doors for her to work as a note taker for the City and County of San Francisco. Despite her busy life of work and school, she continued to provide for her kids and her husband whose mental health was on the decline. It’s hard not to smile when Antoinette proudly talks about her kids, now all grown. As we sit together on her futon couch (provided through a grant from the Home Depot Foundation for veterans and their spouses), she shows me a series of family pictures that include her, her husband, and her kids, all grown up. In one taken about five years ago, they’re dressed up in matching red tops. In another, a wedding photo, her oldest daughter radiates beauty in a stunning, lacy, white gown, next to her husband. In 2016, Antoinette was diagnosed with lung cancer. It was the same year that her husband suffered a stroke – a difficult time for the family, to say the least. 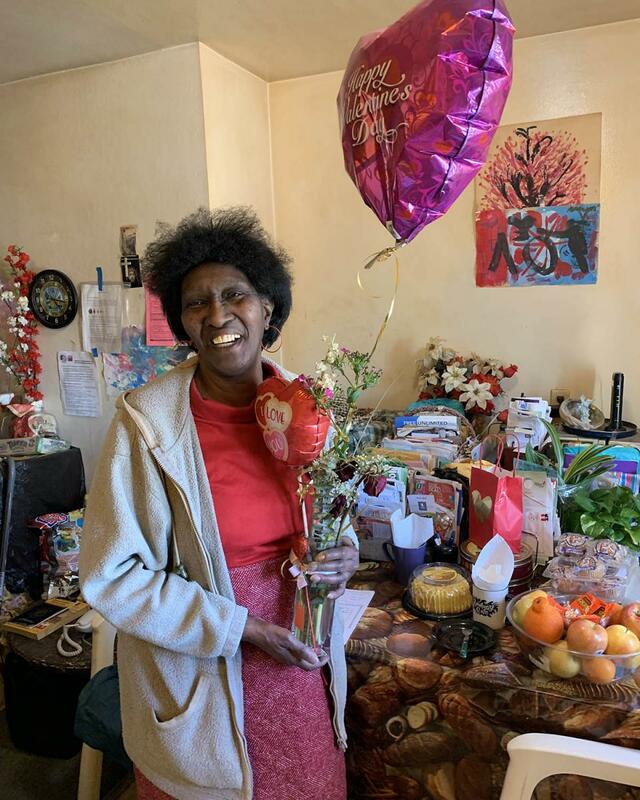 Antoinette had to make the hard decision to move her husband to an Assisted Living facility where he could receive the care he needed and that she was not able to provide. He passed away in May of 2018. Through it all, the loss of her husband, grown-up kids that left the nest, and battling cancer through rigorous chemo and radiation treatments, she remains positive. “As a lung cancer patient, I have struggles, but I hope to overcome and live a long life,” she explains with optimism and a big smile. Antoinette says that she likes when people make something of themselves. “Be all you can be. Even if you’re a bum, you can be the best bum there is,” Antoinette tells me while she lets out a hearty laugh followed by some coughs. 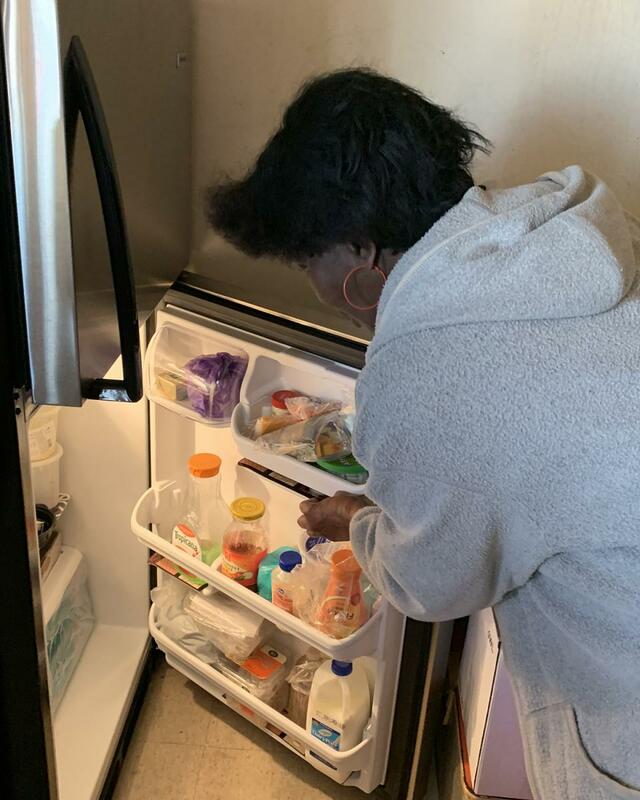 Meals on Wheels San Francisco (MOWSF) provides Antoinette with meals and wellness checks three times a week. Navigating her third-floor apartment, where she’s lived for the past 20 years, lends a particular challenge as she relies on an oxygen tank and cane most days to get around. The meals are particularly important to her because, during her chemo treatments, she becomes fatigued and doesn’t want to “fuss” over preparing a meal. MOWSF has tailored her meals providing her with nutritional options that counter her nausea and keep her healthy. She says that what she really likes about the MOWSF program is that the staff show empathy and demonstrate serious concern for her health and well-being. The Home Depot Foundation grant has helped make life a little more comfortable for her too. During the past couple of years, she has received a new refrigerator, microwave, and even a desktop computer. 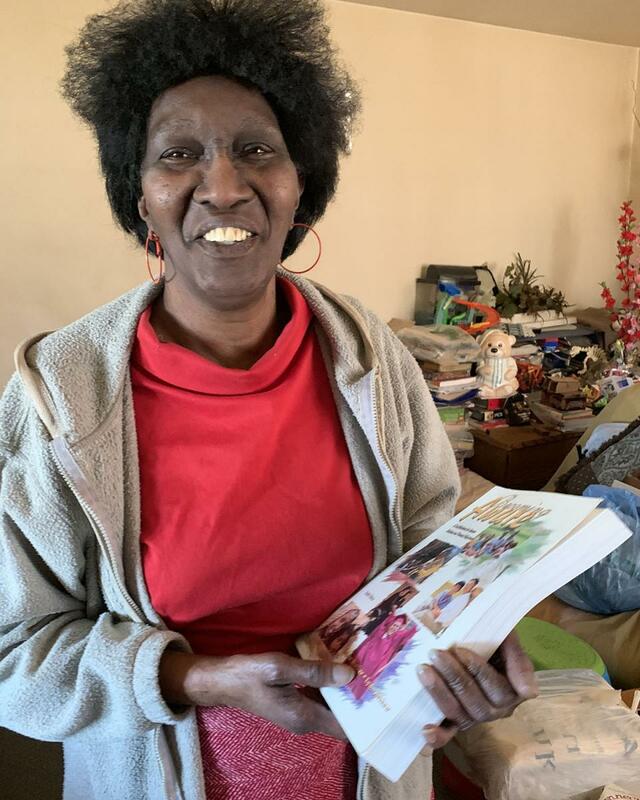 Today, Antoinette remains close with her son who visits her regularly with his 9-year-old grandson in tow who loves going through Grandma’s collection of technical “how-to” books – a reminder of her past careers. Only a week before our visit, she had just finished an intensive round of radiation treatment but appeared energetic and in good spirits. She says the doctors are amazed at how the tumor has decreased in size. Antoinette attributes this to an old British treatment she incorporated into her routine when she was first diagnosed which includes drinking a glass of water mixed with baking soda. She also recommends a cup of coffee with a smidge of brandy.